Legendary JBL pro and home audio performance is now available for the great outdoors. 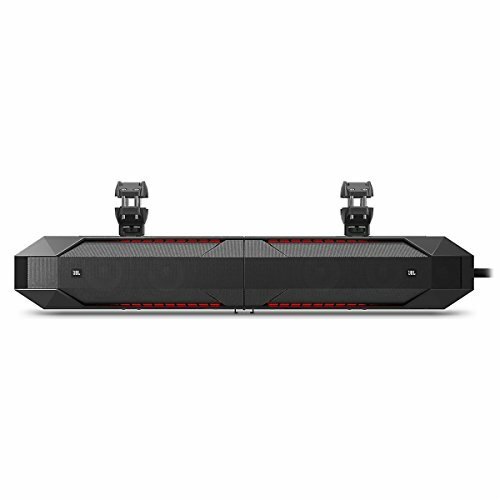 The new JBL STADIUM UB4100 AMPLIFIED Powersports Soundbar is designed for UTVs, boats and other personal and family vehicles built for fun and recreation. Take the wheel or helm and experience the sound of powerful JBL rollicking sound. (Try 105 dB at fifteen feet!) It's also equipped with a super flexible mounting system that fits any size roll cage and will take a 10G shock and stay put. You can also separate the soundbar into two speaker towers to optimize sound quality for any installation. Bluetooth, 3.5mm and RCA output jacks allow you and your friends to take turns streaming playlists. There's a GoPro shoe for an action camera to share your finest moments-like how you look when you hit your first hole in one. With a glowing red LED output display and ambient lighting, you're in the cockpit ready to do things you've never done before-be it on land, sea or a long green fairway. The high performance speaker array consists of a pair of 4"" long excursion mid/woofers and one high output tweeter per channel. The STADIUM UB4000 can also be separated into two speaker towers utilizing the optional Harman SK-300 separation kit which includes a 10' (3m) bridge umbilical cable and rear and bottom filler plates. A versatile mounting system with universal mounting clamps, inserts, and quick release brackets offers easy installation and multi-mounting options-that includes pontoon boats! A detachable RF remote gives you full control over your music wherever you are without having to aim the remote at the Soundbar and worrying about the sunlight washing you out. JBL Stadium UB4100 Bluetooth Marine Sound Bar For Polaris RZR/ATV/UTV/Cart/Jeep. Driver Complement: 4x 4" long excursion woofer; 2x 2" Edge-Driven Dome Tweeters. Sound Bar Weight: 22.7 lbs. Product Dimensions (L x W x H): 31.5" x 6.12" x 5". What's In The Box: 2 Sound Bar Speaker Sections.2 Mounting Brackets.1 AVRCP Remote Control and Battery.2 High Level Adapters.Quick Start Guide.1 Threaded Rod.8 Screws.2 Bridge Plates.2 Hex Bolts.2 Safety Wires. Klipsch R-112SW 12" Powered Subwoofer with FREE WA-2 Wireless Subwoofer Kit.